Easy prep + minimal baking time = real simple! 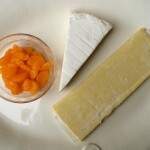 This brie and mandarin appetizer fits the description, and is well liked by children and adults. You will need about 1/4 cup drained mandarin wedges , 1/2 wedge of brie (use rind for more refined palates), one egg, and one puff pastry sheet. After defrosting pastry, unfold and place mandarin wedges and chopped brie in center. Fold edges in, like a burrito. Flip pastry and use a large fork to make vent holes. Whisk one egg, brush the top of the pastry with egg. Place on a lightly greased cookie sheet. Bake at 350 degrees for 25-30 minutes until pastry is golden brown. Serve alone or with crackers.